As regular readers of this blog know, Clif and I will soon be celebrating our fortieth anniversary—on Sunday, March 19, to be precise. To mark this milestone anniversary, Clif and I decided to celebrate often and early with a week of special outings in central Maine. As it is March and still cold and snowy, most of what we did involved food and eating, although we did throw in art and a movie for some variety. We were moving right along with our staycation/celebration, but then Mother Nature had other plans, in the form of a blizzard. That knocked two days off our fun as we hunkered down on Tuesday and then cleaned over a foot and a half of snow. This took us right to Wednesday, and I don’t mind admitting that Clif and I were just plain pooped when we had finished cleaning all that white stuff. Our friends Judy and Paul did bring us lunch on Wednesday—deli cheese and ham, potato salad, sour dough bread—so it wasn’t a complete bust. In fact, lunch was very tasty indeed, and I will be keeping such lunches in mind for other occasions, with pesto and mozzarella added for vegetarian friends. On Thursday, the dog was ill with digestive problems, and we didn’t dare leave him. Fortunately, Liam was back to his old self on Friday. The day was sunny and warm—for March and for Maine—and Clif and I knew where we were going for lunch: To the Red Barn in Augusta. 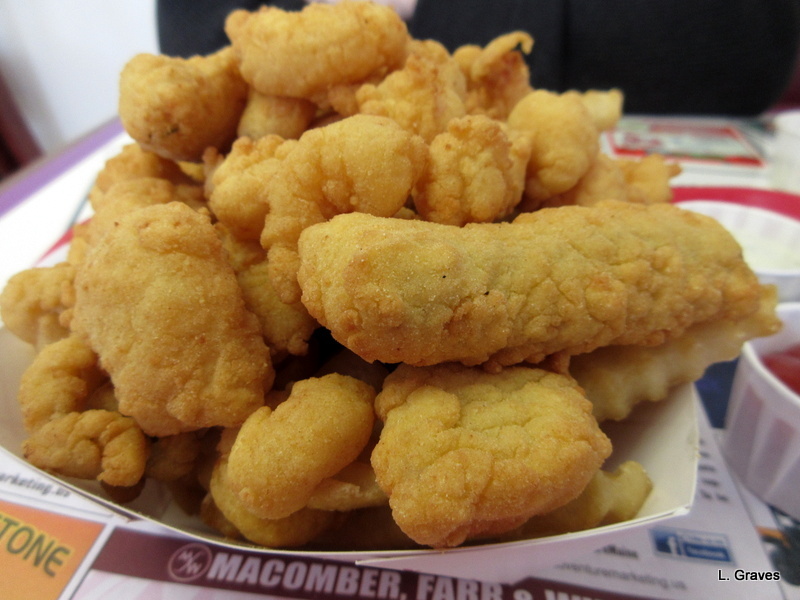 We also knew what we would order—a seafood basket, filled with flaky fish, sweet little shrimp, even sweeter scallops, delectable clams, and French fries. And for dessert? 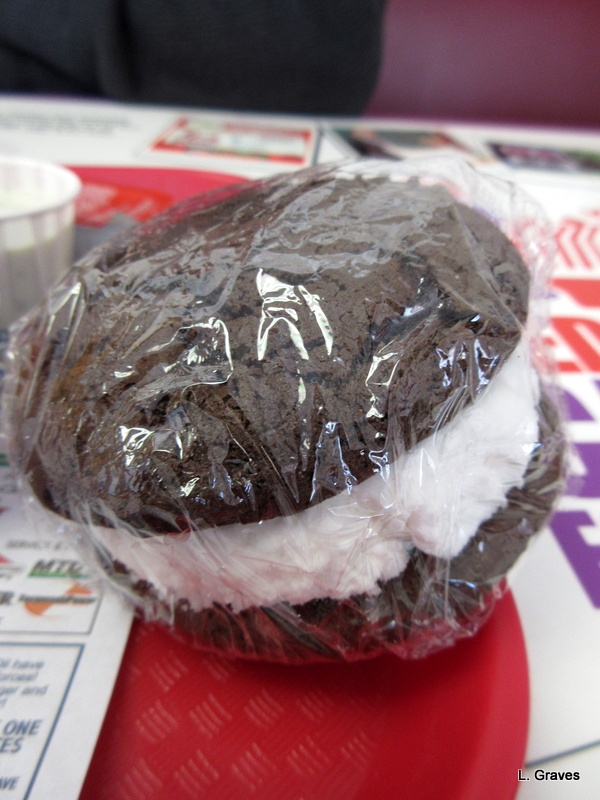 Why, a whoopie pie, of course, to round off this wicked good Maine meal. Now here’s the astonishing part. For this meal, with its fresh, fresh seafood and homemade whoopie pie, we paid $20. Total. Admittedly, Clif and I shared the basket and the whoopie pie. We even shared a drink. But still. For most adults, there is plenty of food in a Red Barn basket for two people, and half a whoopie pie is more than enough after all that fried food. A teenage boy might not be satisfied with so much sharing, but Clif and I are way past our teenage years. The storm that was supposed to hit Maine this weekend decided to bypass us. Hallelujah! This means we can keep to our schedule of anniversary fun. Previous PostAbout YesterdayNext PostTa-Dah! Our Fortieth Anniversary Arriveth! That we are doing! Thanks, Eliza. Happy anniversary! That seafood basket looks excellent, but what on earth is a whoopie pie? Excellent! I have heard wonderful things about the Red Barn, but we have never been there! Keep enjoying your week. If you’re ever in the Augusta area and what a treat, head to the Barn. Thanks, Jodie! Yes, so glad Liam recovered. At his age, it is very worrying when he is so obviously not feeling well.